Americans spent $60 billion dollars on their pets last year: that is a whole lot of love for our four-legged friends. And who doesn't love watching cat videos online? So, why not take two things that are beloved by all–cats and pallet projects–and put them together? Pallets are easy to find and pretty much free. You can combine the two to create a one-of-a-kind, custom cat bed for your feline friend. They'll sleep in luxury and though they won't be able to tell you how much they admire your gift, you'll know. Check out the video below to get full guided instructions on how to make a cozy cat cradle for your kitty. 1. Remove slats from your pallets and be sure to take out all the excess nails and staples so you have smooth wood. 2. Measure and cut 14 pallet slats to the same length you want your cradle to be. Lay out 7 of those slats in a square and measure the center. 3. Tap a nail into the center and tie a string around it and a pen or pencil to the other end of the string. Pull the string taught and mark the wood, making a circle. 4. Use a jigsaw to cut the lines you drew to form your circle. To make another cutout on the finished circle, use something round and large to trace around. In this example, a large spool was perfect for the cutout. 5. Use your jigsaw to cut out the traced section. Sand all your slats with a handheld power sander or a belt sander if you have one. 6. Attach your slats together using wood glue and wood dowels. 7. Move the half moon and lay out 7 more slats. Flip your half moon over and trace it on the uncut slats. Then, you'll follow all the same steps to sand and attach the slats to each other. 8. Measure, cut and sand a couple dozen additional slats to fit between your half moons. Using clamps and boxes, prop one side of the moon up over the other one to be able to space them out and make room for your slats. 9. Attach each slat to the sides of the moon using a nail gun. Sand the entire project again. 10. Measure and cut additional slats to form a square base for the moon to rest on. Use a Kreg Jig to secure the corners together to create a sturdy base and attach it to the cat cradle using long screws. 11. Use a star stencil to trace the shape on the sides of the moon with a pencil. Then, you'll use your jigsaw to cut out the center of the star. 12. Be sure to sand all the jagged edges. 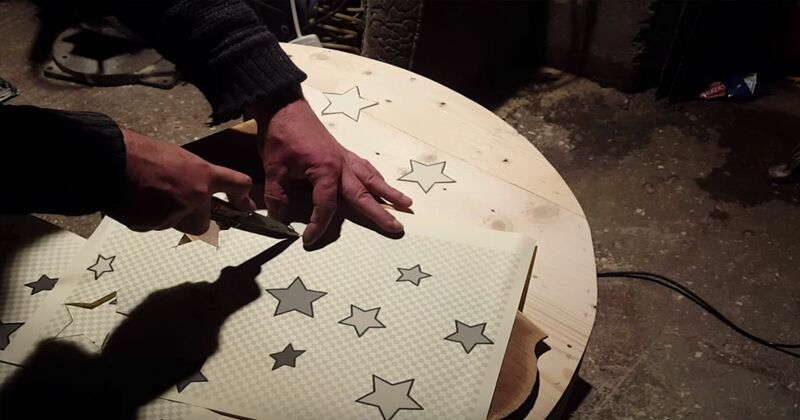 Then, cut out star shapes along the edges of the stars you cut, but don't cut all the way through the wood this time. A router would likely be the best tool for this job. 13. Mix up glow-in-the-dark powder and pour it into the crevices you routed. Once the powder is dry, sand the area again for a smooth finish. 14. Apply a coat of stain and polyurethane to your desired level of opacity and shine. 15. Add a foam mattress to the interior of the cradle. You may have to cut a few pieces to get the perfect fit. Or, start with a small cat mattress and use that to measure all your slats before you begin. 16. 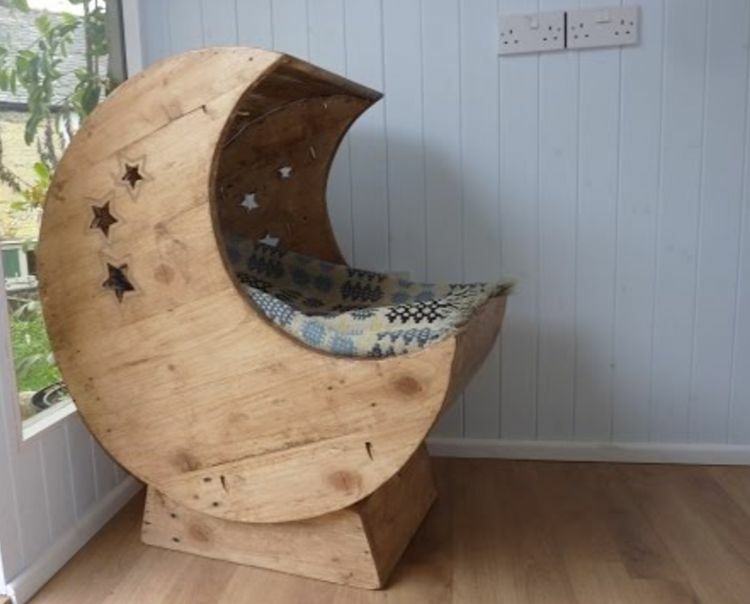 Drill a hole into the back bottom of the cradle using a wood spade and power drill. Feed in LED strip lights and staple them to all the inside corners. Introduce your cat to their new palace! Pro tip: You can use a Kreg Jig to help create a seamless look when attaching your slats together with screws. It helps drill wood pilot holes at perfect angles for you to attach wood projects together without the screw heads showing. High-end looking holiday yard decor doesn't have to break the bank. This pattern is surprisingly simple, and is a great way to add a touch of the outdoors to your quilts.